Before moving to Prague in the summer, I visited two places I’d never seen before, at opposite ends of the country: Cornwall and the Lake District. Initially I’d been a little worried that the Lakes wouldn’t be very vegan friendly, but I had nothing to worry about. 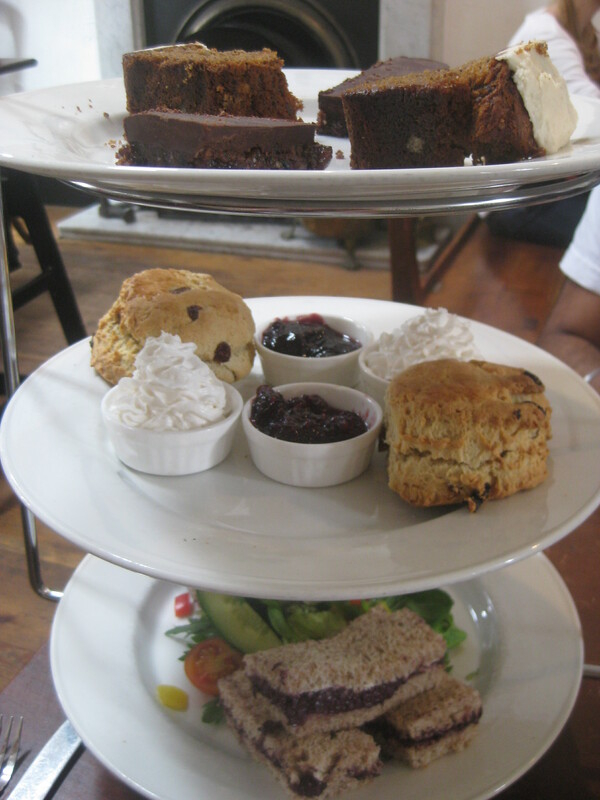 Not only did we stay at an all-vegan B&B, but we even found somewhere to go for afternoon tea. 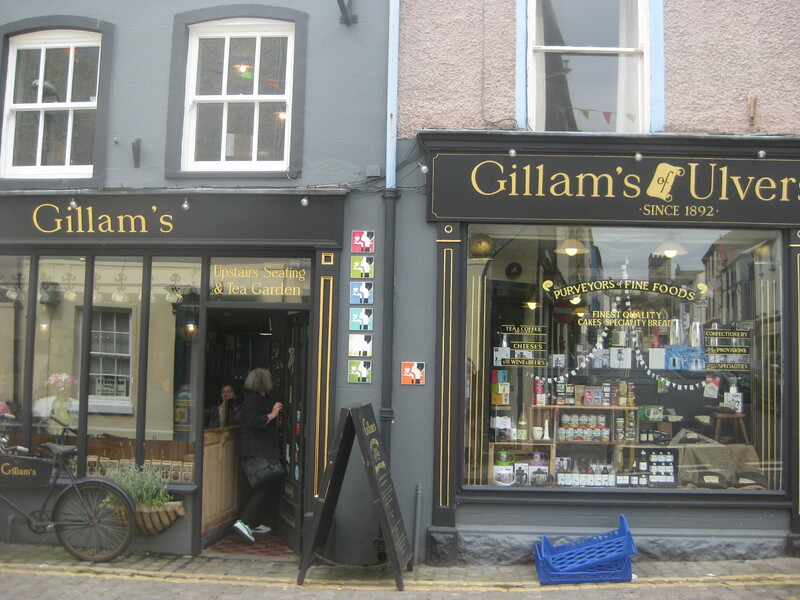 Gillam’s is a vegetarian cafe, and it’s very popular – it was completely full when we visited, and we were glad to have reserved a table. I’ve had a few modern twists on the afternoon tea this year, but this one was good and traditional. 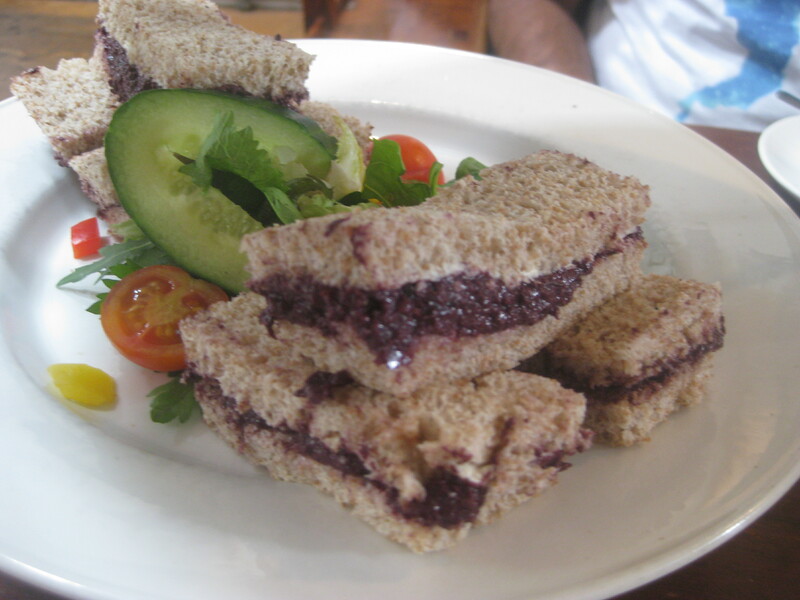 For the sandwiches, there was a choice of any vegan sandwich from the lunch menu – three or four options. We weren’t exactly sure how it was all going to work, so we both ordered the olive tapenade. It was delicious, but very intense with the olive flavour and saltiness, so it would have been better to order another filling as well and switch between the two. 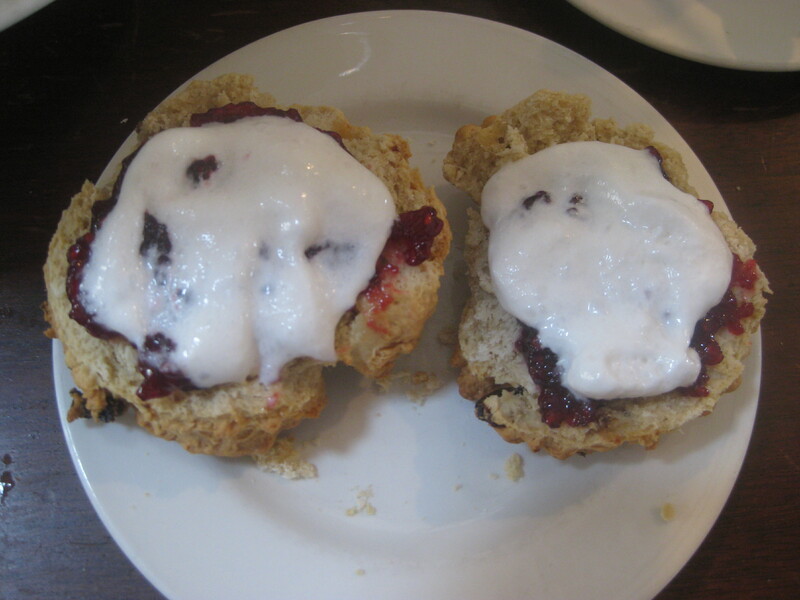 The scones were beautiful – big, easy to halve, and tasty. They were still warm from the oven, and served with whipped soya cream and jam. We were allowed to order any two vegan cakes we wanted from the menu board (vegan options are clearly marked), and they were served in two neat little halves for sharing – so make sure you collaborate with your companion! 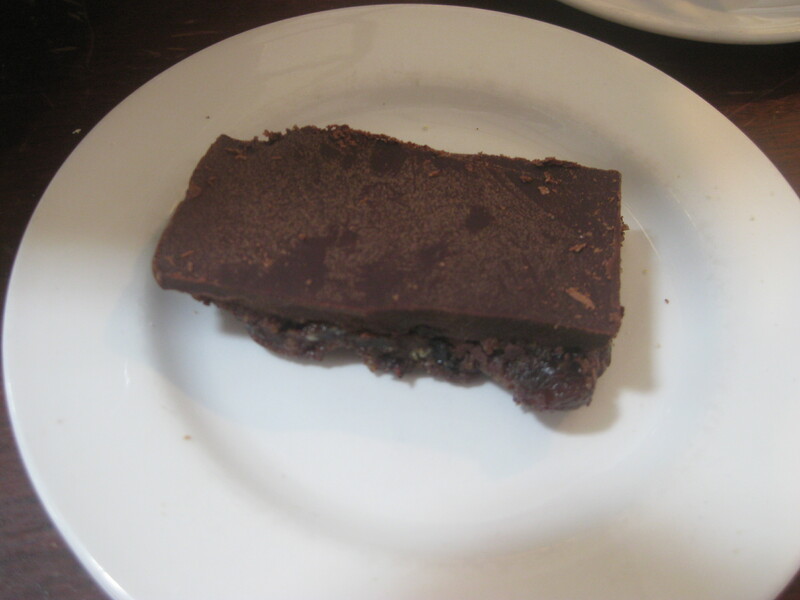 The chocolate tiffin was recommended by our host at Fox Hall B&B, so we had to go for that – and it was excellent! It was very rich, so half a slice was plenty. 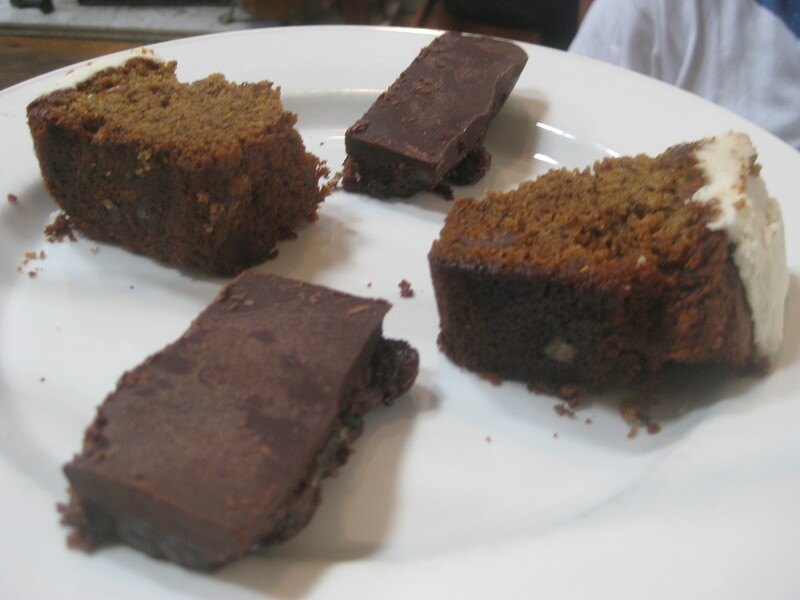 The top layer of chocolate was very thick, and the bottom layer was moist and juicy from the raisins. Oh, it was good! 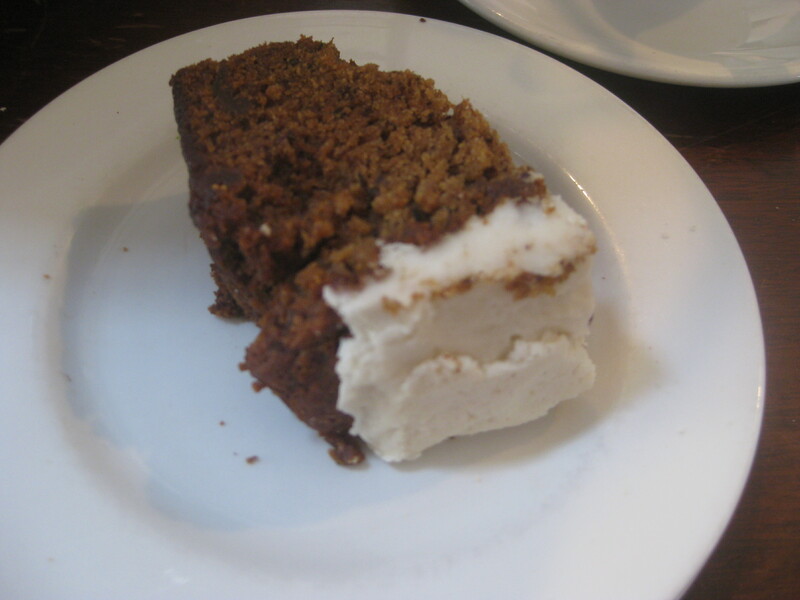 We also had the banana and date cake – it didn’t really taste of banana, to my surprise, but it was a lovely moist, sticky cake with icing that was creamy and smooth rather than gritty, as it sometimes can be. This was such a great place to visit, and it was nice to have a traditional afternoon tea. The owner, Doug, is a vegan too and was really helpful when we were booking. If you’re in the Lakes, make sure to take a break from hiking and fill up on some good food here! 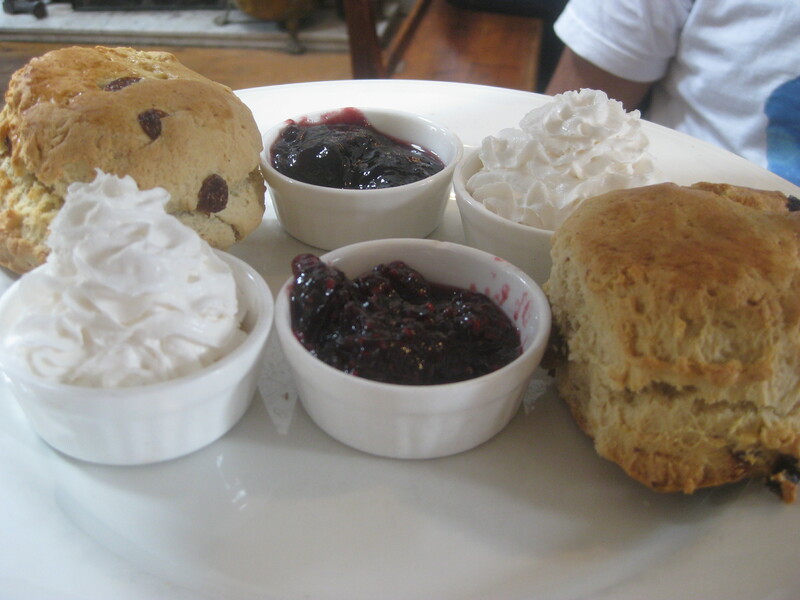 This entry was posted in Afternoon tea, Travel and tagged Gillam's Tearoom afternoon tea, Gillam's Tearoom vegan, vegan afternoon tea, vegan Lake District. Bookmark the permalink. There was a salad garnish on the plate, we had to keep pecking at that for a reprieve! What a great find, I love how many vegan afternoon teas I’m seeing popping up around the UK right now. I know, I thought it would be really difficult to find one for every month of the year, but I actually ended up with more than enough options. It’s great to see.